Our Plasma® 12-strand is the highest strength, lowest creep synthetic rope available. Plasma 12-strand is manufactured from high modulus polyethylene (HMPE) that has been enhanced by a patented recrystallization process. 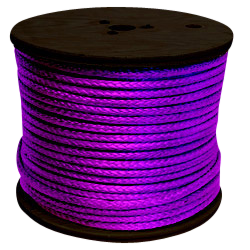 Applications for use include replacement for wire rope, mooring lines, barge lines, lifting slings, winch lines and theatrical rigging. Plasma® 12-strand is delivered standard with a polyurethane finish and is easily spliced.